Alright, so it’s time to mention for the very first time on these pages something incredible going on. The Cleveland Indians have won 23 games in a row. Tonight, they won 3-2 in 10 innings in Cleveland after tying the game 2-2 in the bottom of the ninth with two outs. Jay Bruce redeemed himself after striking out with one out and the bases loaded late in the game with a chance to tie the game by hitting a bullet down the line to win the game. This is nothing short of historic and incredible. I consider it to be the new record in baseball even though it’s unofficial and all because of some team that tied in the middle of their streak before any of our parents were even alive. I also think that Terry Francona is probably one of the greatest managers ever. That’s the only way I can really make sense of all this because; on paper, the Indians are certainly not even the most talented Indians team of my lifetime. I don’t even think they’re the best team in baseball this season. 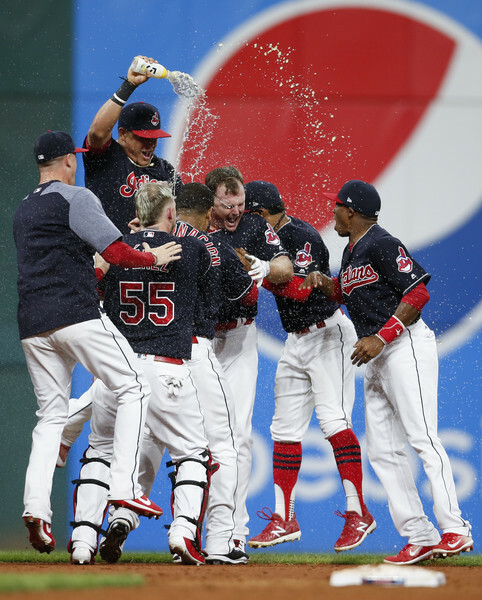 The streak has been nothing short of magical and when you look at who has been responsible for the streak – rotation guys past Kluber and Cookie Carlos, and the pen arms other than Cody Allen – it’s hard to believe this has happened. Their lineup is solid, but again; not even close to the best lineups we have ever seen but neither were the 2002 Athletics. These teams just got insanely hot, played well in close/late situations (better than anyone ever did consecutively in the history of the game) and have gotten some bounces. That happens when Tito Francona is your manager. Hats off to the Indians. Do they reach the dreaded ’23’?